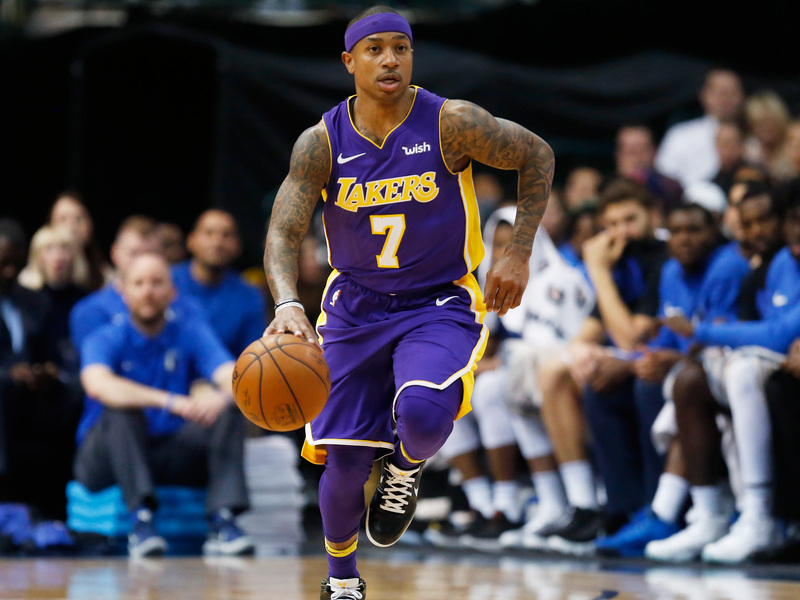 Isaiah Thomas Must Face Harsh Reality During His Time in L.A.
As the Lakers attempt to rebuild, Isaiah Thomas’s presence could undermine the teams' chances of establishing winning habits. Thomas needs a showcase, not a mentoring role. Isaiah Thomas, less than a year removed from All-NBA selection and a top-five finish in MVP voting, is now the cost of doing business. The Los Angeles Lakers didn't trade for Thomas at the deadline so much as agree to take him on. Their real motivation in trading with the Cavs was to move Jordan Clarkson's long-term contract for an expiring one—something they had tried to do for months. Getting back a first-round pick even sweetened the deal, making it easier to part with Larry Nance Jr. in the process. Thomas was somehow both the headliner of the deal and its least consequential piece. There isn't much use for Thomas in Los Angeles, but to bench him completely or waive him outright also seems like one indignity too far. That such a thought would even be considered is proof of how cruel a year can be. Thomas was his best basketball self at this point in 2017, and in the time since has experienced gutting personal loss, a career-altering injury, a trade he never wanted, and the fallout of a toxic situation. Thomas worked for years to prove himself only to be divorced, by circumstance, from his best basketball self. Will Isaiah Thomas Become a Long-Term Fixture in L.A.? His position is a sympathetic one—even after Thomas seemed to willfully make a bad situation in Cleveland worse. Timing is everything. Had Thomas signed a three-year deal rather than a four-year deal when he hit free agency in 2014, his life could be completely different right now. Had Kyrie Irving never requested a trade, Thomas might still be a Celtic, playing his way back in what had been the most fruitful setting of his career. Instead, he is a vestigial player hanging off the side of one of the worst teams in the league. Thomas seems intent to make the most of his time as a Laker, which in itself could become a problem. A star in the later stages of his career can be an impossible player to coach, but a star working his way back from injury isn't much better. A hip injury cost Thomas the very things that made him valuable: his burst off the dribble, his ability to separate, his means to finish. Still Thomas, understandably, wants to be that player. Most of his time on the floor is spent trying to assert what he believes to be true—even when reality suggests it isn't. The motivations involved are understandable. Beyond Thomas wanting to put a miserable year behind him, this summer was supposed to be his "Brinks truck" payday. Thomas told anyone who would listen that he was a max player and had a fair case, given his production, to command it. Now, that option is completely off the table. The Thomas of today is in an open audition for a skeptical league. The question is no longer whether he deserves the max, but whether his play warrants any significant, long-term investment at all. Thomas needs a showcase. The Lakers, on the other hand, need anything but; while there's some good will to be had in letting Thomas work his way back, the minutes and shots given to Thomas contribute nothing toward the team's developmental goals. Lonzo Ball is scheduled to return from a knee injury after the All-Star break and will need considerable playing time. Fellow rookie Josh Hart has shown that he deserves a regular look. The Lakers aren't so stacked with young talent that they can't afford some minutes for Thomas, but at issue is what message those minutes send. If you're Luke Walton, head coach of the Lakers, how can you teach a young team to lock in defensively while also featuring and rewarding Thomas—who is not only a terrible defender but an unreliable one? How could you ask your players to take smart shots when Thomas, a 37% shooter for the season, will come into every game gunning for his next contract? What ground do you have to tell a team to take care of the ball when Thomas is frittering away possessions at an unconscionable rate? In some sense, that Thomas racked up 22 points and six assists in his Lakers debut—a loss to the Mavericks in which defense was more concept than reality—looks like a bad omen. "I felt like I got my powers back playing on this team," Thomas said that night. In his next appearance, he was ejected after just five minutes of play. In the game that followed, he shot 3-of-15 from the field with five turnovers in just 25 minutes. The underlying question is this: What does a mutually beneficial outcome for both Thomas and the Lakers even look like? To give Thomas what he wants in terms of playing time and role would, at best, offer no lasting benefit to the Lakers—while actively denying opportunities to vital prospects. At worst, his play and involvement could actively undermine the organization's attempts to build winning habits. Thomas is many things, but selfless is not one of them. That wasn't a problem when his game could carry an offense. It may be one now that he has no possible claim to.